Every so often, something happens and you think, oh my God, something is happening and I don't know how to deal with this, what the hell should I do? Write about it. Yesterday afternoon. I was filling out medical forms on line so that my younger son could get his allergy medicine at sleep-away camp. I was typing in dates for all of his various immunizations, uploading his picture so his counselor would recognize him and writing about his "strengths" (very social) and "vulnerabilities" (might be homesick). Then I saw an email from a broadcast associate from the CBS Early Show. She saw the post I did on kids and drinking last week and wanted to talk to me about it. Was I interested? Let me think about it for a nanosecond, okay, yes! I should just back up and write that the The Wall Street Journal did a story yesterday that was similar to the one I posted last weekend. The CBS reporter was working off the Journal story and found my blog. She wanted to send out a crew that afternoon to interview my older son and me. The only problem was that a) I hadn't showered; b) None of the beds were made; c) There were dirty dishes in the sink and piles of bills and medical forms all over the kitchen table; d) I had to drive an hour round trip to pick my older son up from chorus practice; e) The crew was going to come at 6, smack in the middle of dinner/homework time and my younger son had a big geometry test to study for. But, it's hard to say no to a TV appearance when you're looking for a book contract and your older son is hoping for a career as an actor and stand-up comic. Plus, I had appeared on FNN and CNBC a bunch of times back in the Nineties when I was working for Business Week so I thought I knew what to expect. FNN had a deal with Business Week where they would pay us $100 and interview us about the stories we'd published that week. A car service drove us to and from FNN, a makeup woman covered up the circles under our eyes, and the interviewer asked us easy questions about stories we'd just written. It was fun, and we returned to the office feeling slightly famous and tiny bit richer and prettier. One of my editors left Business Week and went to CNBC. He asked me to try out for on-air reporting job. I said okay. About one week into the try-out, I got pregnant with my first son. I was sluggish. My hair was too long and I was too tired to get it cut. I was gaining weight. I didn't feel like going out and interviewing people in person. I just wanted to sit by the space heater under my desk and talk on the phone. When I finally confessed to the guy who was trying me out that I was ten weeks pregnant, he smiled wanly and said, "Congratulations." Then he said they were going to have to hire a speech coach for me anyway and they weren't sure they wanted to spend the money to do that and blah blah blah. Hello motherhood, good bye on-air reporting career. This was shortly before Maria Bartiromo became known as the "Money Honey." I have few regrets, but fifteen years later, I still have the TV bug. Truthfully, I don't even watch morning news. But it was still exciting to be asked and I knew my kids would enjoy it, so I threw the dishes in the dishwasher, moved the pile of bills, hopped in the shower, guzzled a diet Coke and went to pick up my older son. The reporter who had originally been assigned to the story was sent to Rhode Island instead. The piece was reassigned to a CBS crew already shooting in New Jersey. They arrived half an hour early. My kids and I raced to brush our teeth and comb our hair. My younger son was hungry and irritated that he wasn't being interviewed. The correspondent who showed up was a beautiful young woman named Taryn Winter Brill (picture). Her producer and cameraman moved the living room couch and pushed two chairs into the room. Taryn interviewed me in the living room and my older son in the dining room. I saw on the stairwell and listened. Forgive me for kvelling, but he was poised and thoughtful. That was good, because I was sweating. Had I been articulate? I think I made it clear that I do not advocate serving alcohol to minors, but I didn't want my kids flying blind in life, and if there was a way to prepare them to resist temptation at parties by letting them have sips of alcohol at home or trying a cigarette on the patio, I was going to let them do it. Taryn asked if I would ever let them try anything illegal, like heroin, cocaine or crack. Absolutely not, I said. I'm trying to teach them how to be responsible at parties, not develop an addiction. The interview was a huge wake-up call. It is much easier to be interviewed about companies and their various challenges than it is to discuss your philosophy on raising teenagers. And a live Q&A is a far cry from answering (or even acknowledging) readers' comments and questions on a blog or news site like the Patch. My goal is for this blog to be funny, honest and occasionally thought-provoking. As a journalist, I was trained to be irreverent and skeptical. In graduate school, I was told to develop a voice and a sense of humor. As I was speaking to the CBS correspondent about teenagers and alcohol, I had to choose my words carefully, and stress responsibility and safe choices. There was no room for irreverence or humor. As I listened to my older son talk to Taryn, my head was spinning. I had just finished a short story collection for a contest that Jhumpa Lahiri was judging. I teach news reporting to local college students and creative writing to adults in New York. A few years ago, The New York Times shocked the hell out of me and called this blog "funny and poignant." But now it looked like if I was going to be known for anything, it was that I occasionally give my older son a sip of wine. Then there's the title: Flawed Mom. Were viewers going to think my thinking was flawed? Oh no! But I could see how the question would come up. When I first started this blog in 2007, I didn't want to pretend to be the perfect mother, dispensing nuggets of idealistic parenting advice. There was enough of that already in parenting magazines. Almost every parenting book or article I've read has made me feel seriously inadequate. I'm flawed and often overwhelmed by the work it takes to get my kids where they need to go and help them "make good choices" (apologies to Jamie Curtis's line reading in "Freaky Friday.") I figured other people were too. I wanted to write about parenting, but not in a way that was gooey, overly sentimental, and striving for perfection. I love the memoirs of Mary Karr, Vivian Gornick, Anne Lamott, and JR Moehringer: I love wrenching honesty when it's served with a big dose of levity. I've never wanted to be deadly earnest about anything, but now that I was writing about teenagers and alcohol, and discussing it on national television, that's what I had to be. After the interviews, the cameraman filmed "B-roll" of me working at my computer. He spent so much time filming my hands clicking away on the keyboard that I deeply regretted not getting my nails done. We moved downstairs. He filmed my kids eating leftover lasagna and macaroni and cheese and our dog scarfing up food off the floor. My older son observed that there was no chance anyone would confuse us with "Keeping Up With the Kardashians." Life goes on and ours might fleetingly be on TV. 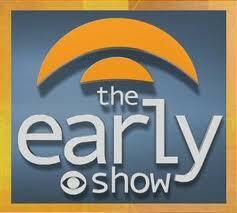 The segment is supposed to run on CBS's Early Show Thursday or Friday, sometime between 7-9 a.m. This morning, the woman who sent me the original email warned that we could get bumped for "breaking news." Oops, I had forgotten about Charlie Sheen. If we don't get bumped, I'll post the link here.